In the era of big data, analytical methods have to be fast and effective. Traditional statistical and rule based methods cannot keep pace with volumes and variety of data being collected. They will miss patterns of data that could improve decision making. The time has come when there is little option other than starting to consider automatic machine learning on an enterprise scale. Patterns in data can be identified and used to calculate the probability of events in the future. The prediction can be done in real time applications, such as intensive care monitoring in hospitals. There seems to be a view that machine learning, pattern matching and prediction is expensive, slow or inaccurate – or all three! Here is an example that demonstrates otherwise. 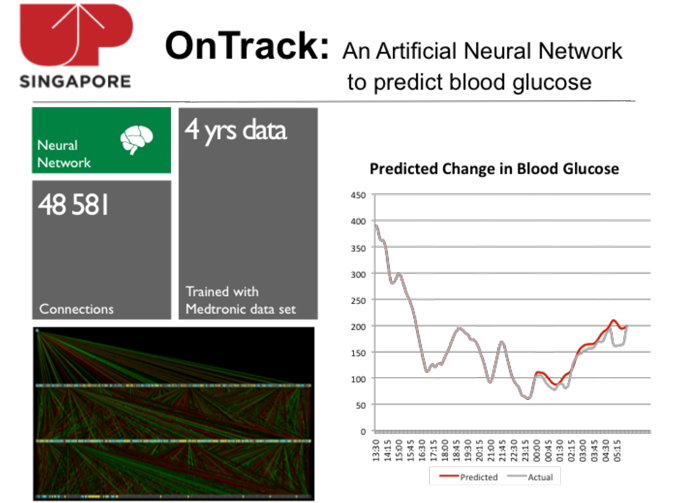 A Hackathon produced a prediction of blood sugar level in a diabetic patient in less than a day. The machine learning algorithms were not meditated by any additional clinical input. Similar techniques could prove invaluable in care of the elderly, early dementia and psychiatric patient monitoring. This Predictive Monitoring hackathon was held in Singapore. The UK should be more proactive in supporting such machine learning innovation, or a lead in vital technology could be lost. Digital technology will impact everybody in the second half of their lives. The age from 50 to 100, for the vast majority of people, will be a decline of most faculties until death do them claim. Now is the time to think of the technology implications and develop a policy for public debate. Here’s a table that shows the decreasing personal digital needs of people over 50 and the increasing needs of their family, friends and service agencies. There’s an shift from being active and independent to moribund and entirely dependent and others. There a wide range of intermediate states of health and vigour, and digital needs should be individually tailored for the best outcomes. The Internet of Things will lead the revolution. Low cost home networked sensors are critical to the way forward. It also needs good communications to data centres and analytical software as part of an affordable infrastructure. Automatic sensing of changes to normal behaviour are necessary, in addition to the commonplace detector alarms. With intelligent investment, the UK could develop a World leading technology industry. over 80% more people aged 65 and over with dementia (moderate or severe cognitive impairment) in England and Wales by 2030 compared to 2010.
ensure older people only go into hospitals or care homes if essential, although they must have access to good specialist and diagnostic facilities to ensure early interventions for reversible conditions and prevent decline into chronic ill health. Technology has a part to play – small in terms of overall costs – but a critical part of the Ageing Infrastructure. Today, this is inadequate, fragmented and and inflexible. This provides great opportunity for UK technology and the TSB is investing, such as the DALLAS programme. Innovation is key. Another source of innovative ideas is coming from social media culture; informal meetings of people with ideas and energy. Have a look at the Meetup network. The Internet of Things has a very active group and Health 2.0 is looking at Dementia this week (there are spaces). Quarkside does not need to do research when there are already good resources. For example, a review of the Telecare market produced by the Aktive project. The UK claims to be leading the world and the Technology Strategy Board is pumping funds into ageing related projects. The message is that people should consider installing technology in the whilst they are fit and active. This will have to be self-funded, because statutory health and care agencies bodies will not pay until there is a crisis. By monitoring normal daily activity, advanced software can detect changes that point to action that could prevent a crisis. Potential savings are enormous. Being able to live in your own house for one year extra is worth £30,000 to £50,000. The minor problem for the elderly, or major opportunity for entrepreneurs, is that nobody is supplying a low cost home activity monitoring service. DIY is not an option. Not many people realise that elderly people become more disengaged with ICT as they become older. They ‘fall off the bandwagon’. There is plenty evidence and the relevance is summarised in this St George’s House Consultation. This theme will be followed in subsequent postings. The new Compose is a serious threat to use of Gmail. It is so trimmed down as to be unworkable. Things like sending address, to: CC: and BCC, reply to all, attach a file and even more, were easily viewable and usable with one click. Now it is several clicks through meaningless icons. It is a hindrance to productivity. Fewer clicks and comprehension wins over blank space every time. The old screen, which used words, is impossible to re-find. The very least should be a clear option to choose. In their defence, it may be easier to use on a small screen smartphone device and that may be their most lucrative target market. However, they could easily identify the screen size and adjust the presentation to suit. Their user interface design team should take note of the differing needs of their clients, especially the elderly – who disengage if change disrupts their normal behaviour. Randomly moving a mouse pointer brings up new icons, which may or may not be useful. What is wrong with showing all the options available?